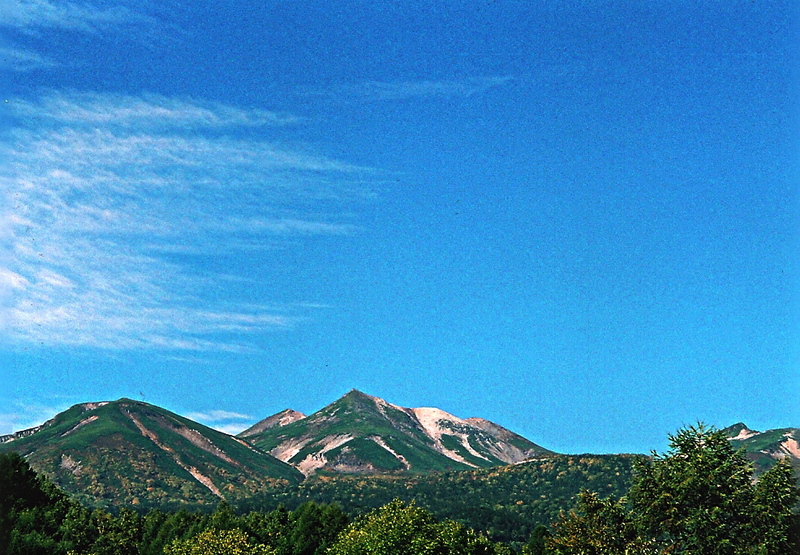 The most direct route from Matsumoto to Osaka is not up and over a 3000m high volcano. Regardless, I somehow convinced myself that climbing Mt. Norikura is indeed on my home and I’d be foolish enough not to drop by and say hello. This justification had nothing whatsoever to do with the previous day’s soggy ascent of Mt. Yake. Nor did it have any connection to the picture perfect weather that presented itself on a wonderful autumn in early October. I checked out of the hotel early and boarded the train to Shin-shimashima, where a bus was waiting to whisk me to Norikura-kogen. 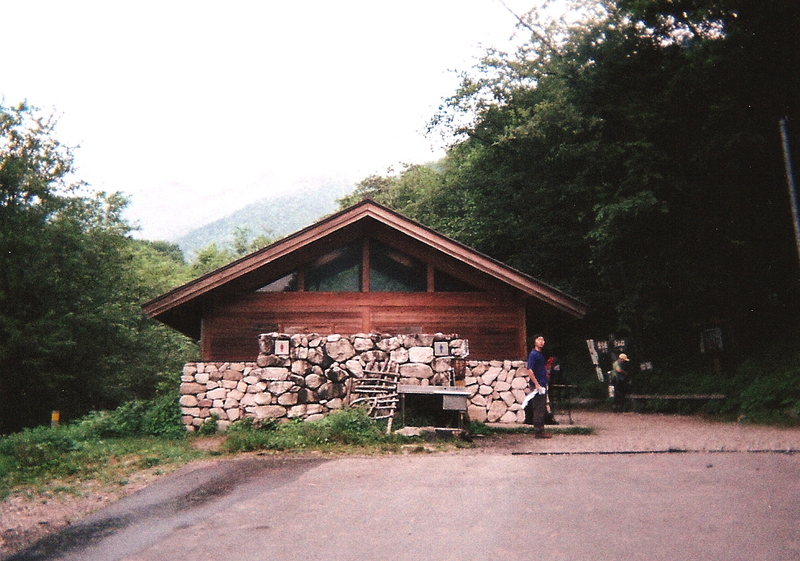 From there, I queued up for the long, windy shuttle bus to Tatami-daira, the site of a recent bear attack. The overdeveloped plateau, situated at 2700m above sea level, cuts a good 1000 vertical meters off of what used to be a challenging climb. The massive parking lot is a testament to the extraordinary crowds that swarm the peak during the summer months, but on this calm, cool Monday morning there was hardly a soul in sight. 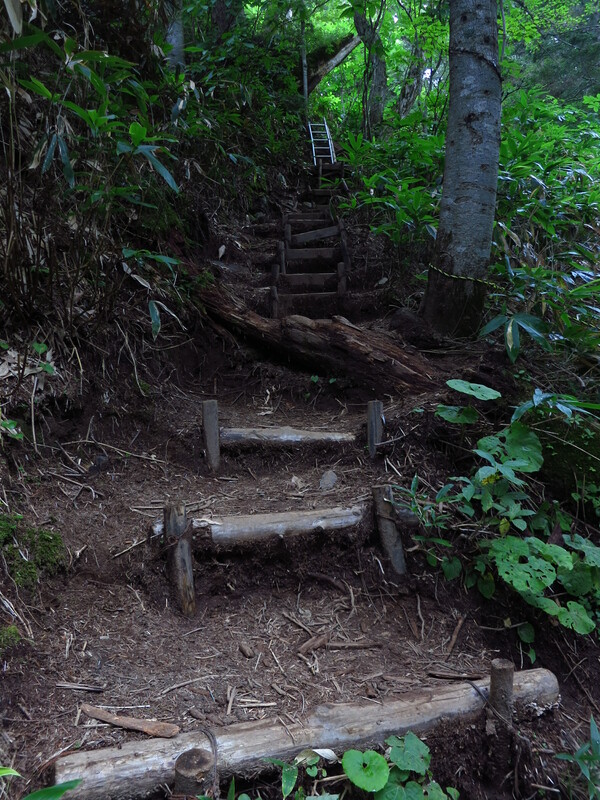 I flew up towards the summit of Mt, Fujimi, only to be slowed by an endless array of wooden steps built into the exposed hillside. “Perhaps I should’ve done a few laps around the parking lot before setting off,” I admitted, realizing I was an early victim to the thin air. Panting like a out-of-shape St. Bernard on a hot, muggy day, I tiptoed up to the top of the peak, where, on a clear day, the conical shape of Mt. Fuji stands out on the horizon. Clarity wasn’t a problem on this particular morning. Even though I could see every other peak within a 200km radius, Mt. 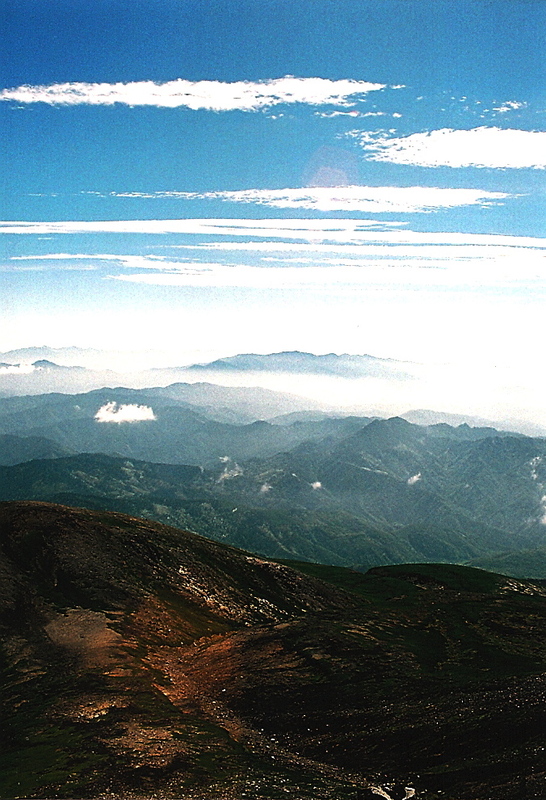 Fuji and the peaks of the Minami Alps were playing a game of hide-and-seek among the convective clouds. 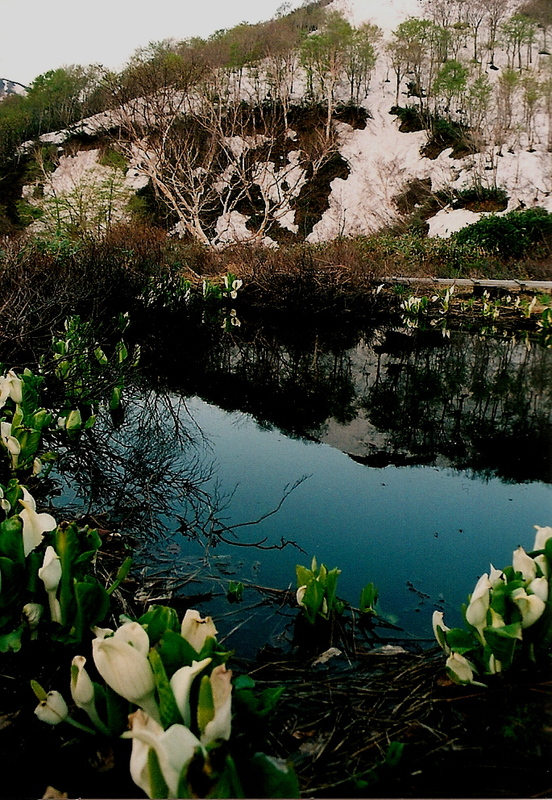 scenic volcanic lakes. 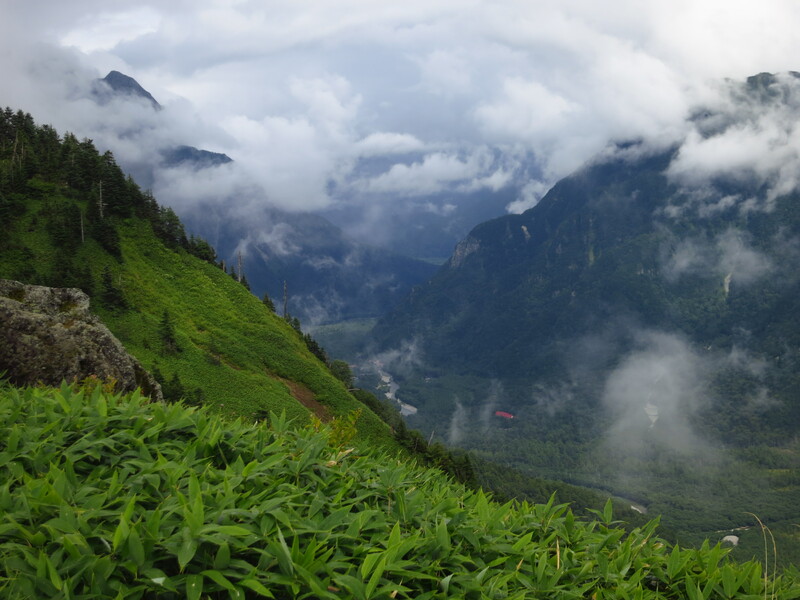 In fact, most of the visitors stay on the asphalt trails well below the semicircular peaks above. 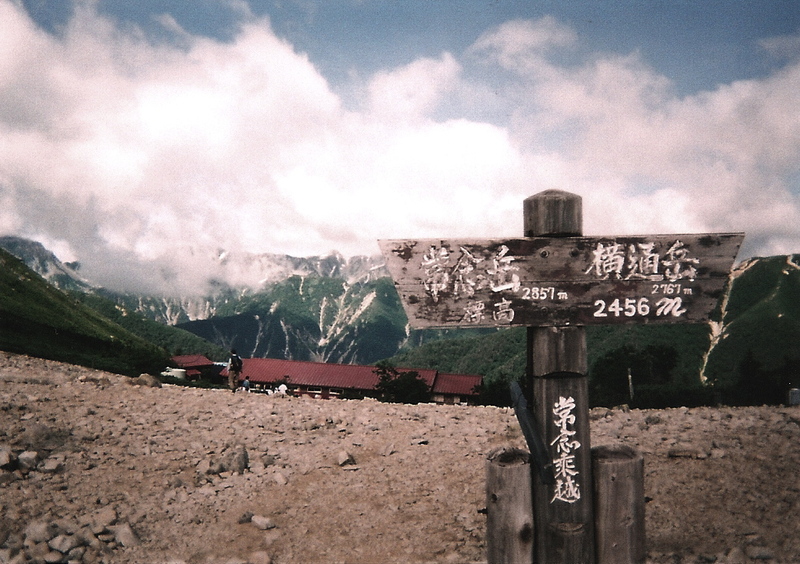 I had Mt. Fujimi completely to myself, but ran into a few groups as the trail met up with the concrete again. I didn’t mind, though, as the outstanding weather more than made up for the unwelcome companionship. 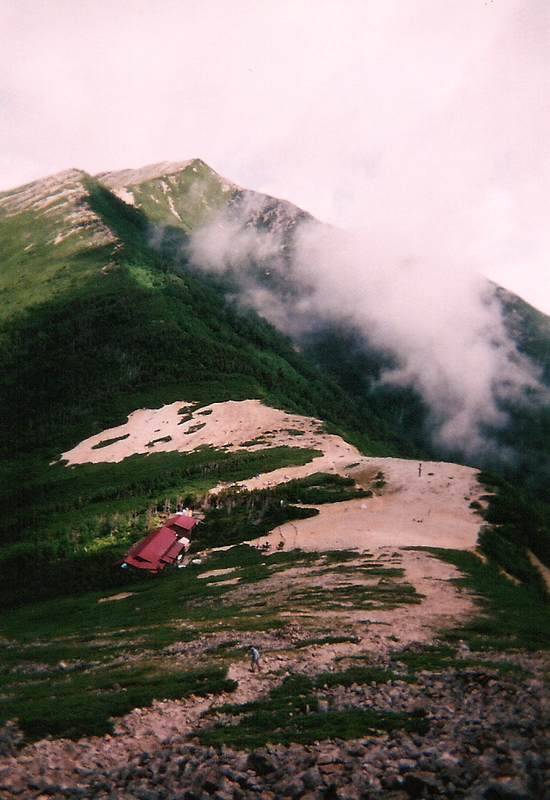 Scooting along on a concrete path, past a large, well-equipped mountain hut, I finally caught a glimpse of the summit of Ken-ga-mine, the high point of Mt. 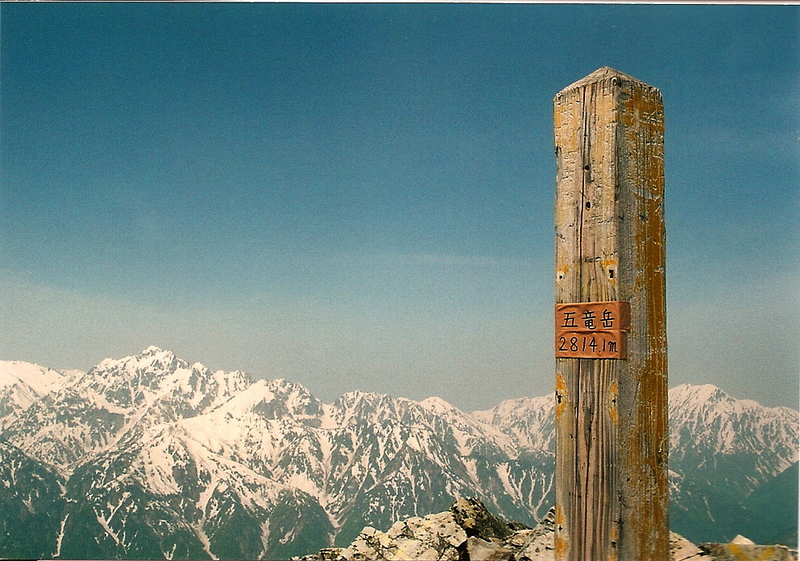 Norikura. 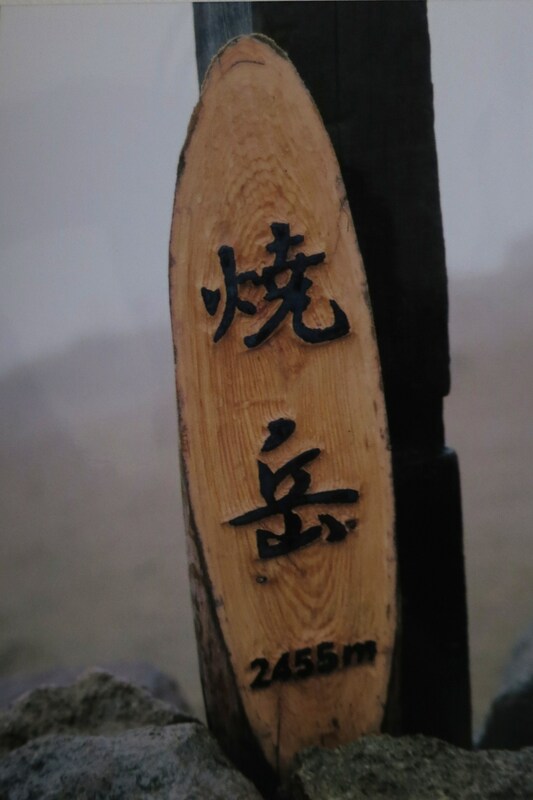 With my body finally acclimatized, I flew past crowds out crawling pensioners until reaching the large shrine on the peak. Panoramic views in all directions more than made up for the misty drudgery of the day before. Mt. 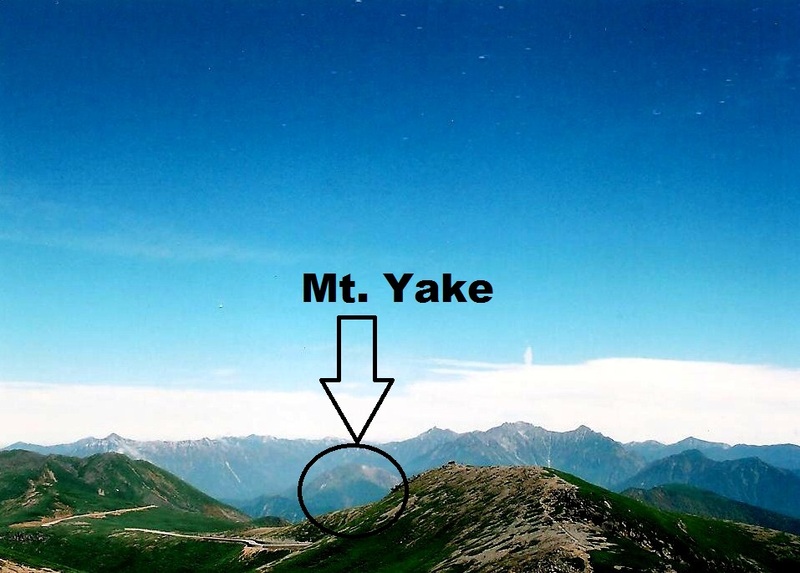 Yake stuck its steaming tongue out as if to tease me for climbing in such bombastic conditions. “Revenge will be mine”, I vowed. After the necessary summit proofs, I retraced my steps back to the parking lot and caught a bus towards Takayama and then a train back to Osaka. Mt. 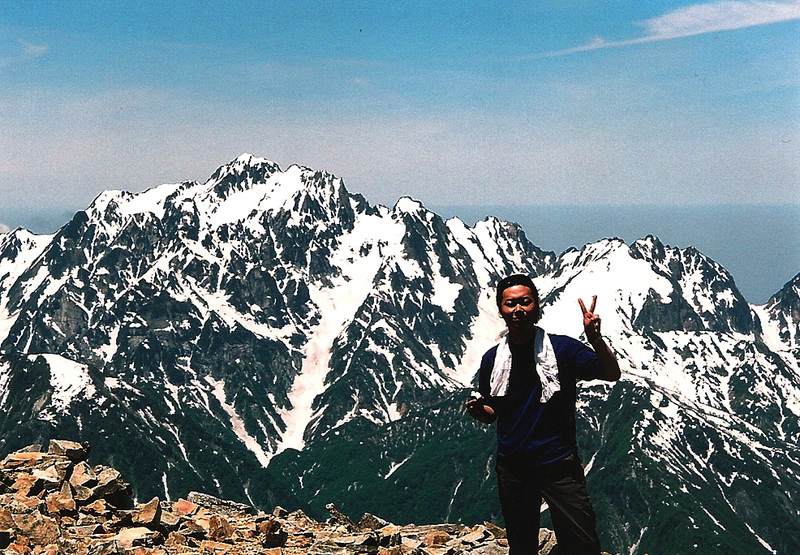 Norikura definitely thanked me for dropping by on the way home, and wished me luck on my upcoming attempt of Mt. 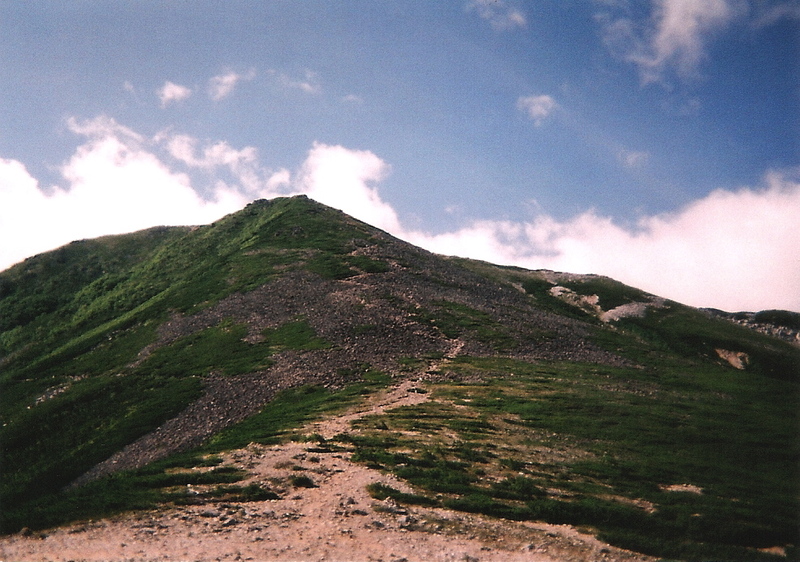 Arashima, mountain #39. The summer of 2006 was turning out to be truly epic. 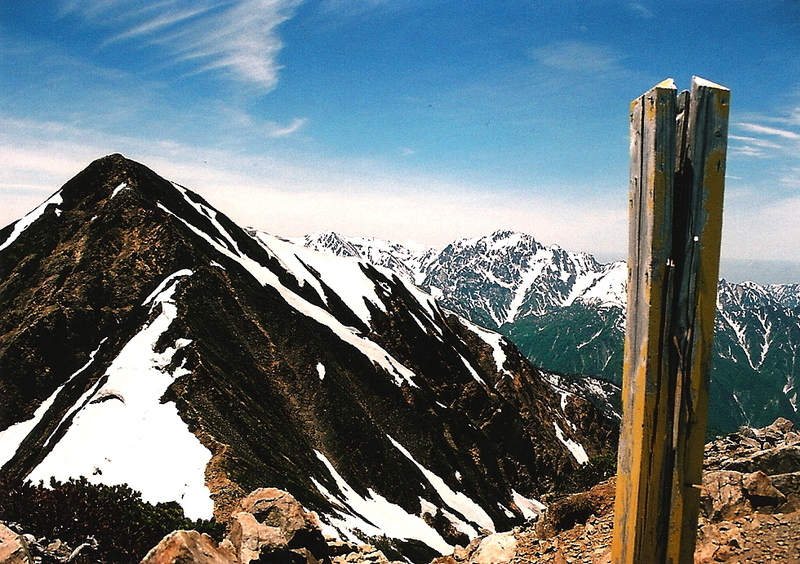 After an incredible 12-day, 10 mountain stint knocking off the peaks in Tohoku, I decide to up the ante by attempting an up-and-back ascent of Mt. Jonen, a behemoth monstrosity towering over the wasabi plantations of Toyoshina city. Map times suggest allocating 8-1/2 hours for the round-trip journey, so Fumito and I were keen to get an early start. 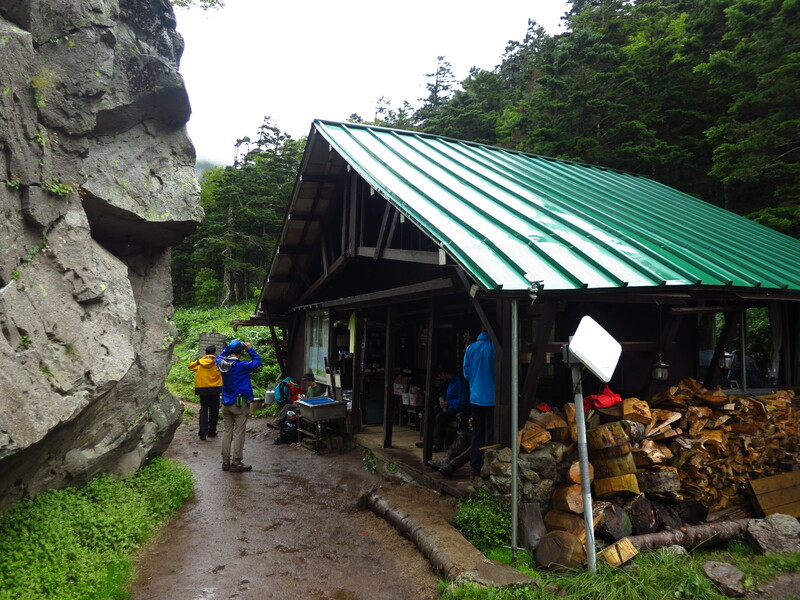 Fumito picked me up at Shiojiri station, breaking the news to me as gently as he could: “the forest road to the trailhead is closed, so we’ve got an extra 4km hike each way.” We head to a nearby restaurant to work up a game plan before agreeing on a 3:30am departure. We pick up supplies before heading off for some rest. Dusk had barely shown itself as we headed up the deserted forest road. After a pleasant 3-1/2km warm-up we found the reason for our extra work: directly in front of us lie a 20m wide crevice, the victim of some major erosion during the most recent rainy season. Makeshift scaffolding formed an unsteady bridge across the gaping hole, and 200 meters further on, a huge beech tree sat directly in the center of the road, having miraculously stayed upright after sliding down the adjacent hillside. Once reaching the start of the hike at Hiedaira we made excellent time, following a beautiful river up the ravine towards our target peak. We hit a comfortable stride, surprisingly even ourselves by knocking through a section in a little over an hour that the map said would take 3-1/2. 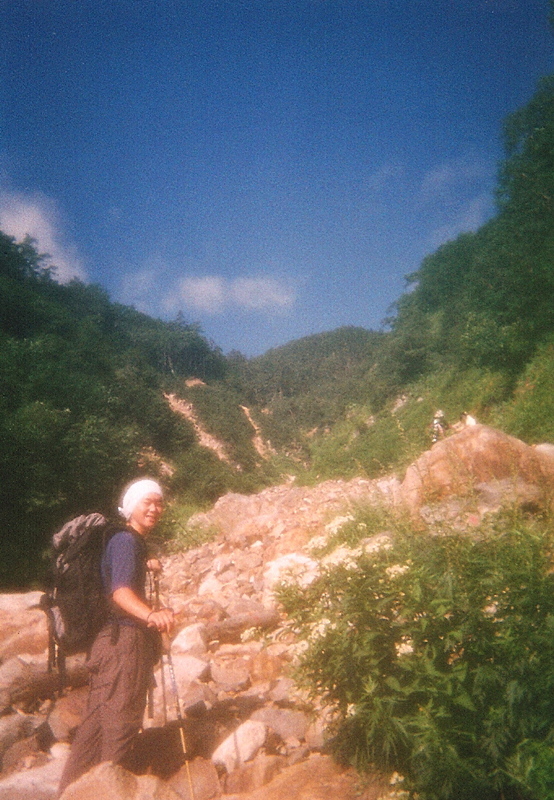 We took our first real break at the point where the trail left the cool waters of the river and started the steep zig-zag towards the ridge line. It was here that we met our first hikers of the day, having descended from the higher peaks earlier that morning. The sky was a deep azure, but we’d knew the cloud would inevitably roll in as the heat from the valley below met the crisp mountain air. Could we make it up before being enveloped in a torrent of cloud and mist? 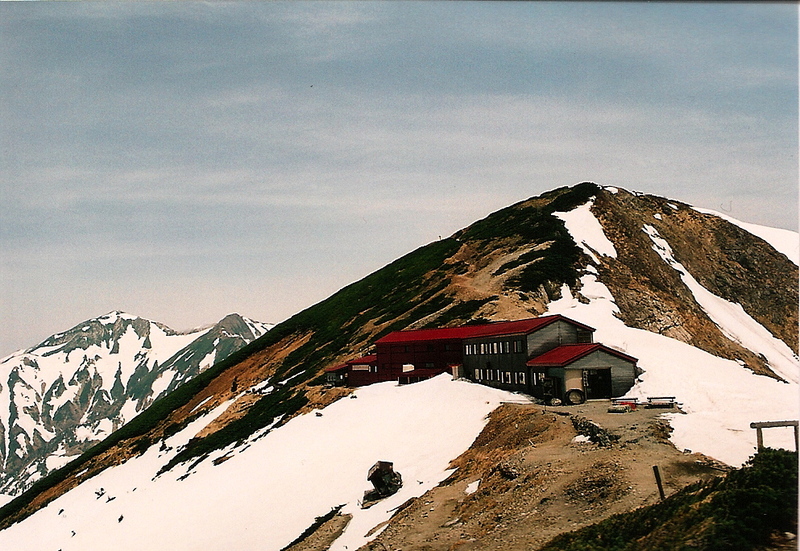 Our pace remained constant until reaching the hut at the saddle. 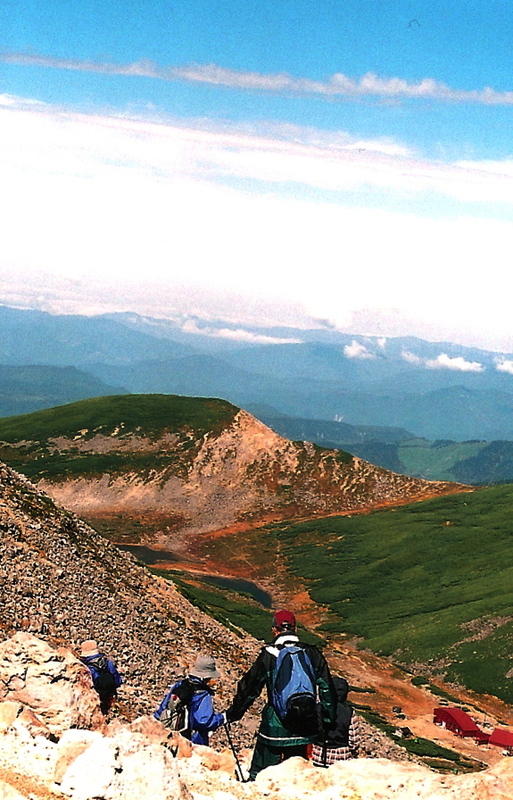 2400m above sea level, with the Hotaka range spread out directly in front of us. Mt. Yari was socked under a thick blanket of fog, while Oku-Hotaka was beginning to hide its head for the remainder of the day. Meanwhile, the clouds were building directly behind the summit of Mt. 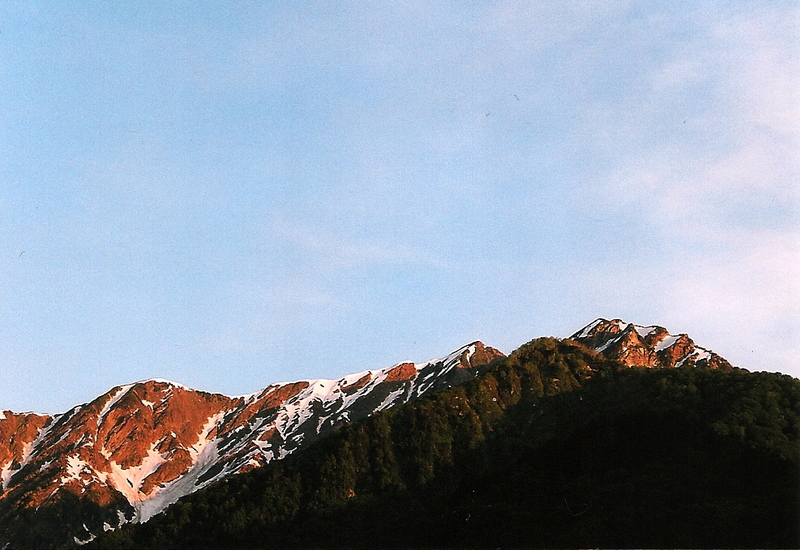 Jonen, a mere 400 vertical meters away. Despite the proximity, our pace slowed to a crawl, a victim of the thinning air and encroaching cloud cover. We had maybe 500 meters between us and the summit, but were making serious vertical elevation gains above the tree line. The hut we just departed from grew smaller and fainter by the minute, until it disappeared out of view completely. 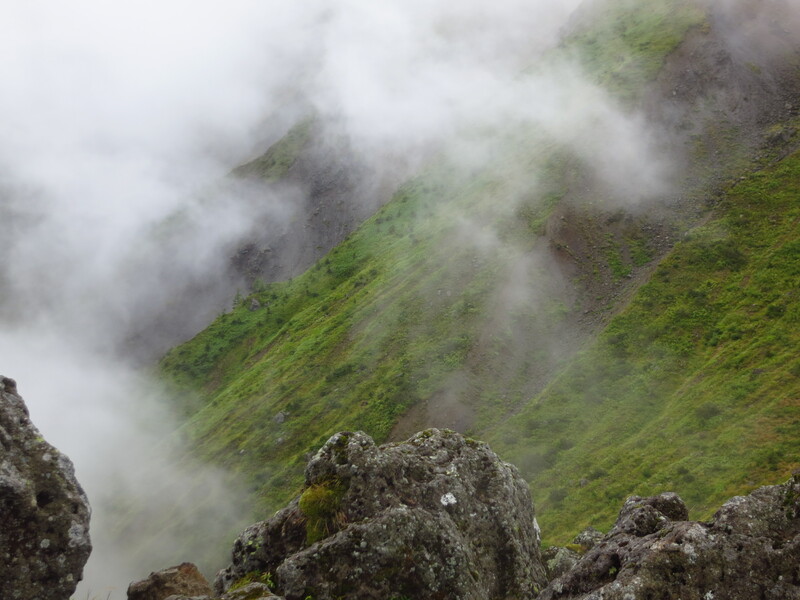 Undaunted, we pushed on, breaking out of the clouds just before reaching the signpost and tattered shrine on the exposed summit. We’d done it – another peak with a view as we stood in T-shirts at 2800m, wiping the hard-earned sweat from our brows. 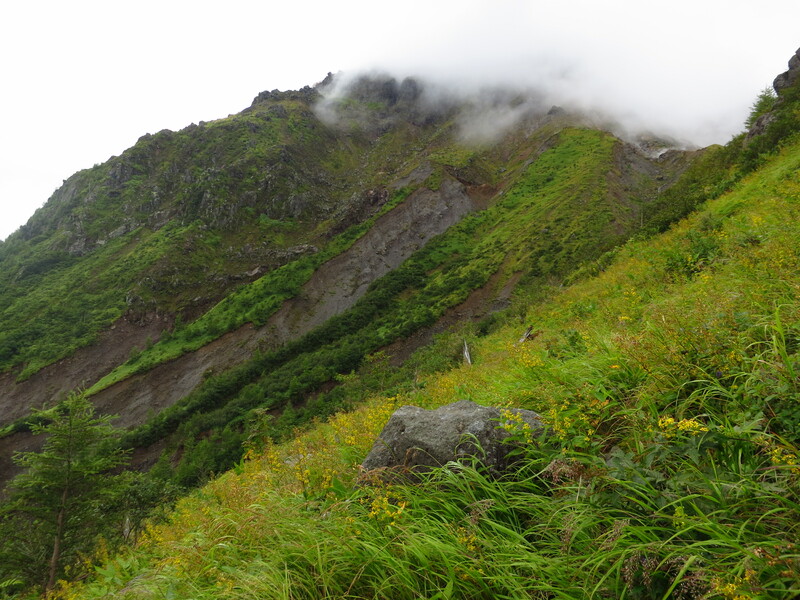 We wasted no time in descending my 64th peak, fearful that the thickened coverage might spawn an afternoon thunderstorm. Back at the forest road, we slowed our pace again, reflecting on our gargantuan effort. The hot spring we visited a short time later was most refreshing, as was the torrential downpour we experienced in the outdoor bath. Once again we’d beaten the rain, but I knew that my luck would eventually run out during the impending typhoon season. After all, my goal of reaching #75 by year’s end was truly in sight. Exactly 2 weeks to the day after my thrilling climb of Mt. Amakazari, I sit in a tent at the beginning of a gated forest road, plotting my next move. 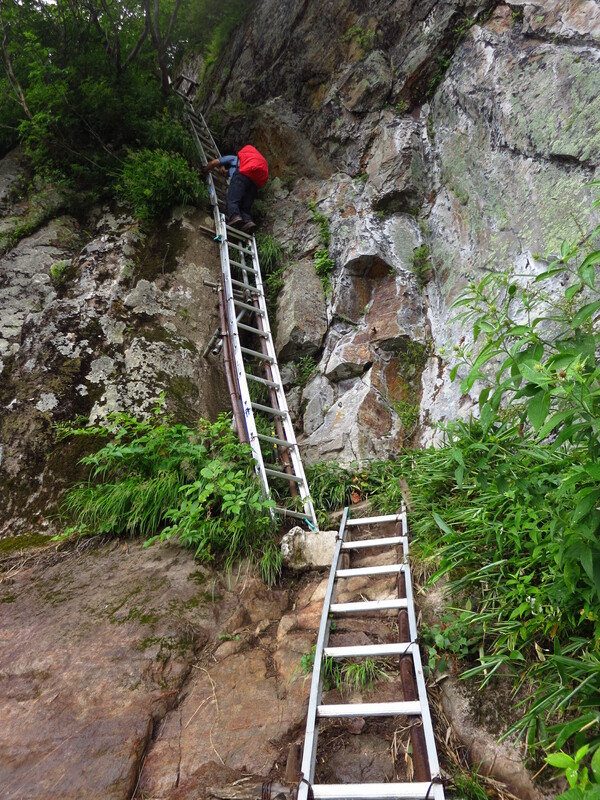 Fumito and I are about to embark on another gargantuan hike of a mighty mountain, during the rainy season! 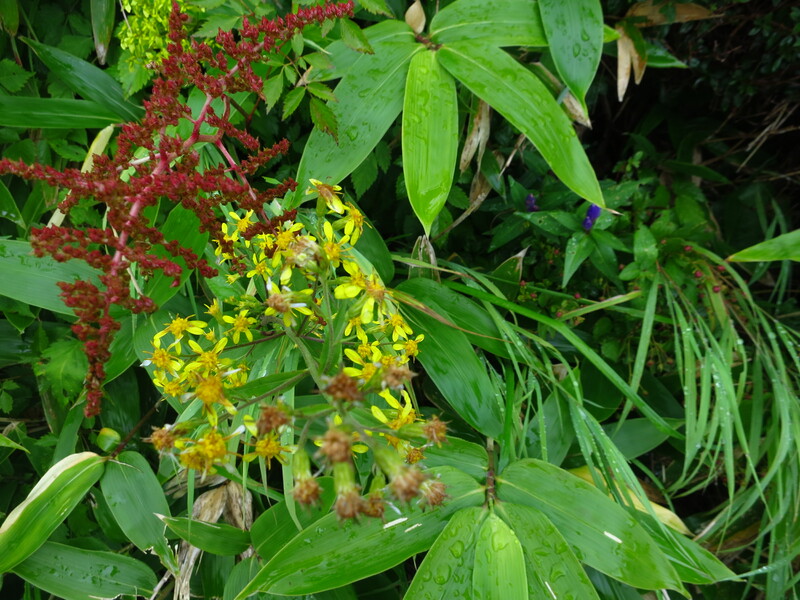 Could I continue my lucky streak in the battle against the rain? 4:00am. With the skies still dark and the wind calm, breakfast is cooked and served. 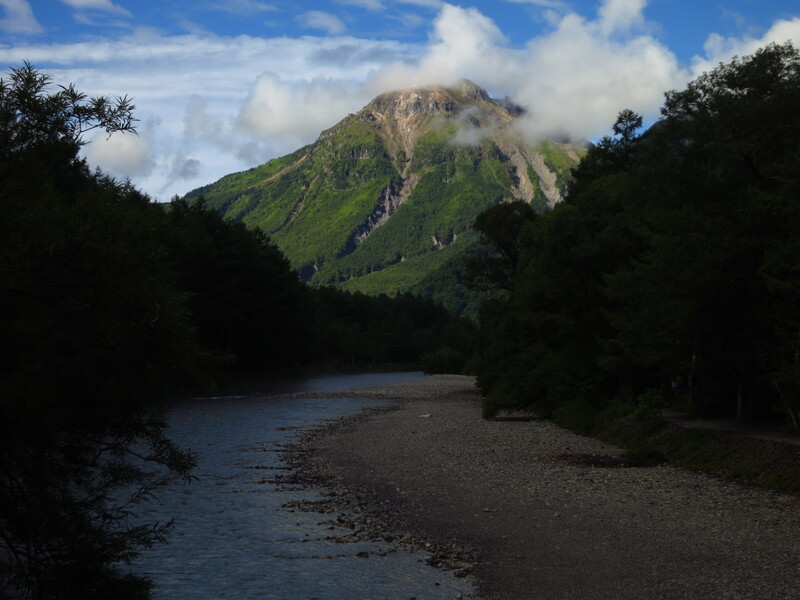 We’ve got a long way to go on one of the toughest day hikes in the Kita Alps, so an early start was critical. After breaking down camp, I took a short stroll across the river to try to catch a glimpse of the ridge line, in hopes of assessing snow conditions. Crampons were foregone in favor of ice axes. The weight we’d save would be replaced by nutrients. The red glow of the sun on the high peaks was promising, as was the lack of cloud cover. Barometer readings were also in our favor, so we set out on the long, deserted forest road in high spirits. 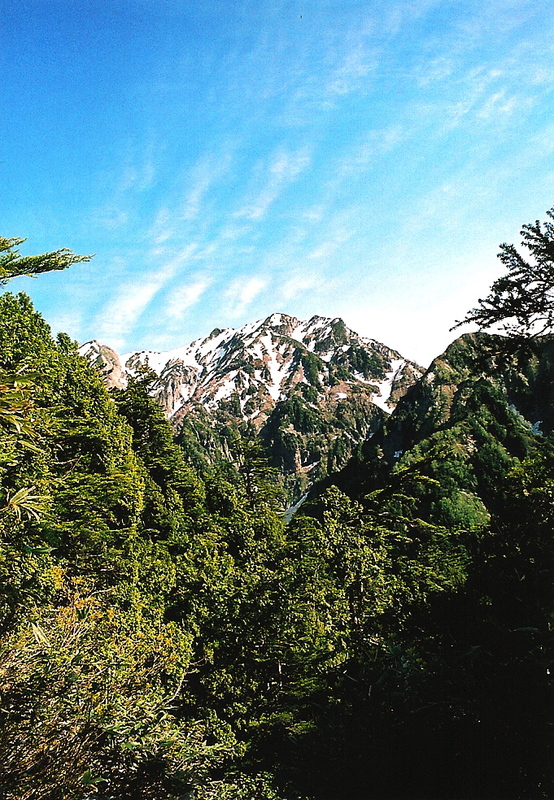 At the end of the road, we headed into the hills, along the Akaiwa spur for a 1200m+ altitude gain. Step by step we rose high above the valley, shedding layers of clothing with each advancing trot. It was hot, and oh so clear. “What happened to the rainy season?”, I asked Fumito, hoping that my question wouldn’t set mother nature off on a temper tantrum. About 90 minutes into our climb, nature threw up its first road block: a huge ice fall blocking the path in front of us. 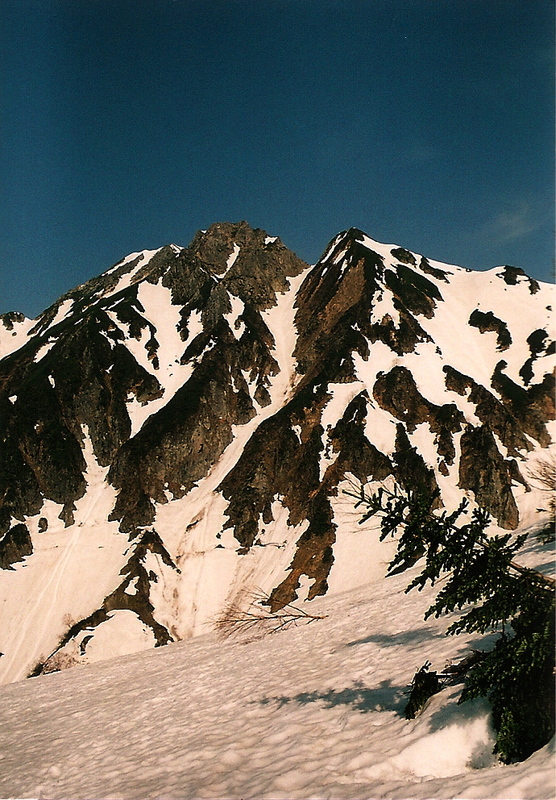 Beyond that, there was a steep snow field that was impassable without crampons. By sheer luck, someone had hacked out a ridiculously steep alternative route, bypassing our obstacle. Grabbing whatever lay in our path, we forced our way up and around the barrier. Fumito took the lead, while I followed a short distance behind. All of a sudden, my companion lost his balance and grip, sliding above me to my left. Acting on my reflexes, I reached out and grabbed his backpack, but the bag slipped right through my hand, cutting two fingers in the process. Just as my worst nightmare was beginning to see the light of day, I witnessed the most impressive feat of my entire existence on this earth. Tumbling barely 5 meters, Fumito somehow managed to break his fall in the canopy of a small beech tree, thus averting a major disaster. 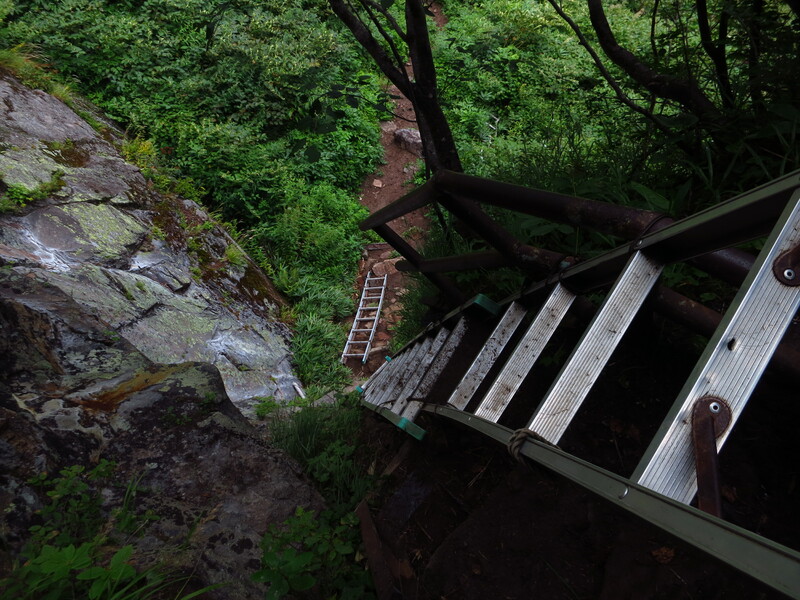 The entire event unfolded in the blink of an eye, as the luckiest man in Japan climbed back up while I tended to my wounds. “I’ll take the lead from here,” I quipped. Once out of the danger zone, we found the normal path and took a break to reflect on what transpired. Fumito was completely unharmed, and I’d lost some skin on my fingers, but the bleeding had stopped so we ventured on. We arrived at Takachihodai, where our first glimpse of Kashimayari came into view directly in front of us. If we could somehow build a rope bridge over the huge valley between us and the peak, then we could cut a few hours off the slog. 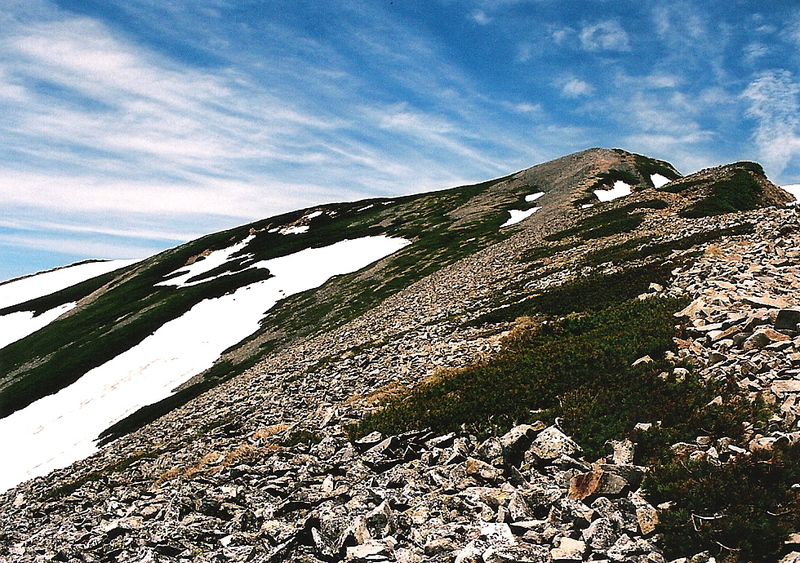 Unfortunately, we’d have to continue climbing parallel to the peak until reaching the ridgeline, where we’d be able to head over to the summit. The path became much rockier after leaving the flat area, but fortunately most of the snow was gone. Just before popping out on the ridge though, we had to traverse through a large, unstable snow field. I was petrified of breaking through the snow and tumbling down to my death, so Fumito once again took the lead. This time, he kept his footing and I managed to avoid the holes, but we wondered how we’d be able to traverse it on the descent. 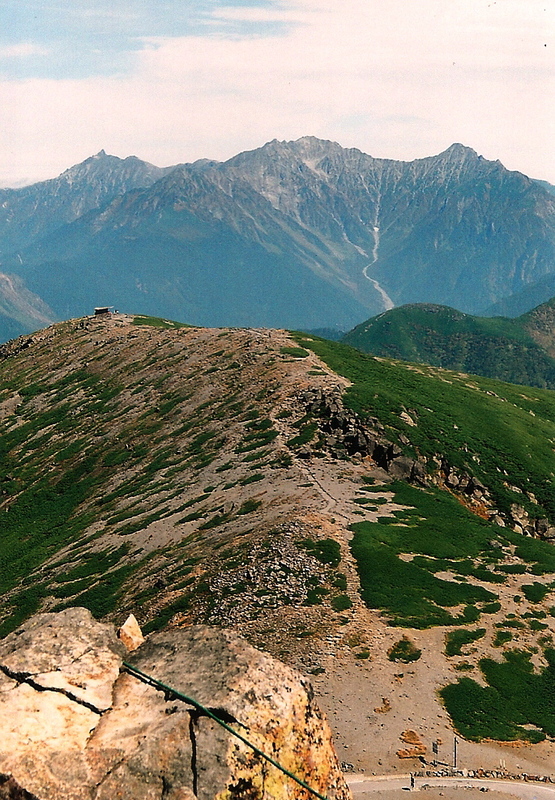 We hit the main ridge line, where Tateyama and Tsurugi were patiently waiting. Mt. 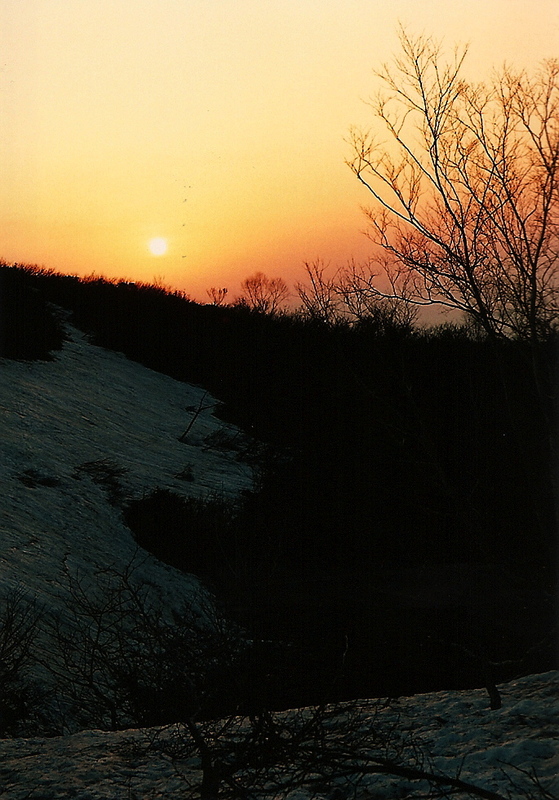 Fuji even popped her head out on the horizon and the sky looked as if satsuki-bare had never left. 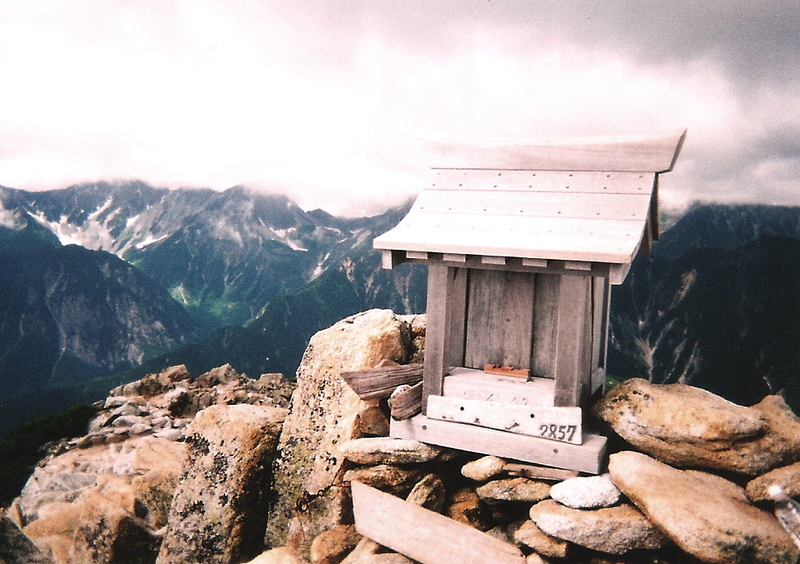 We marched on to the mountain hut and filled up on water. 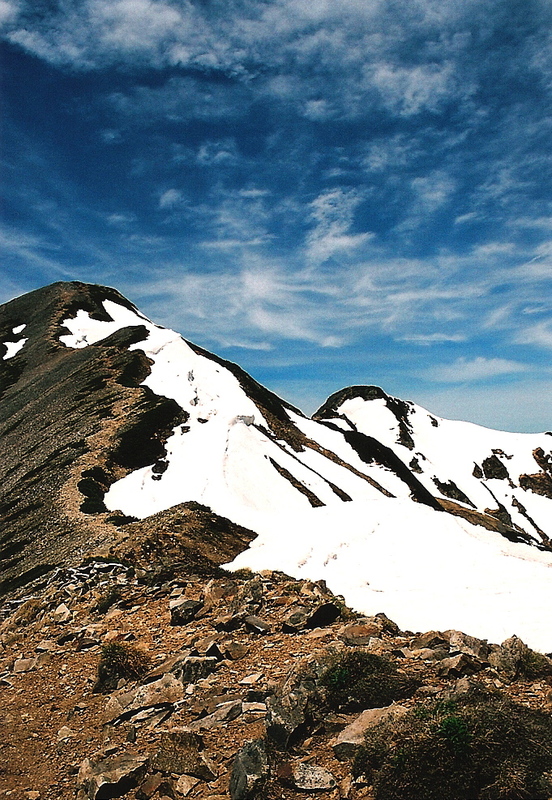 Then came a gargantuan climb through an enormous snowfield to the summit of Mt. Nunobiki. Exhausted we were, but we plodded on, reaching the top of the southern peak just before noon. Mt. 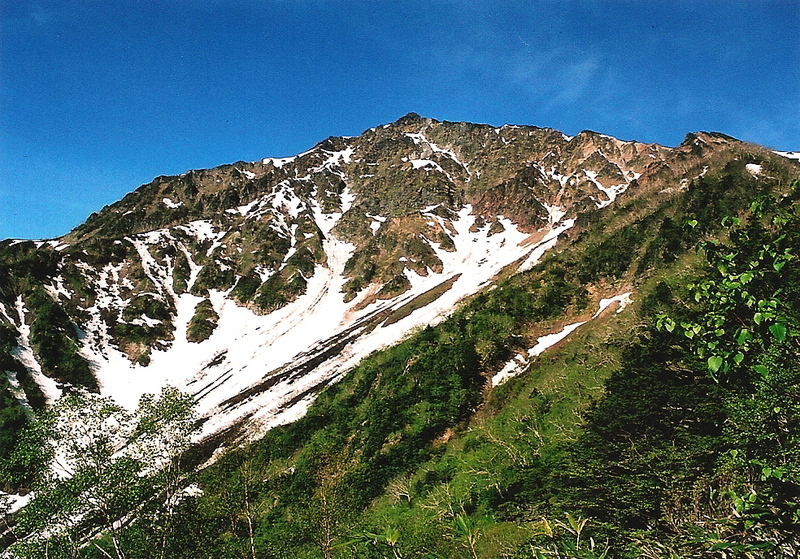 Kashimayari, just like Mt. 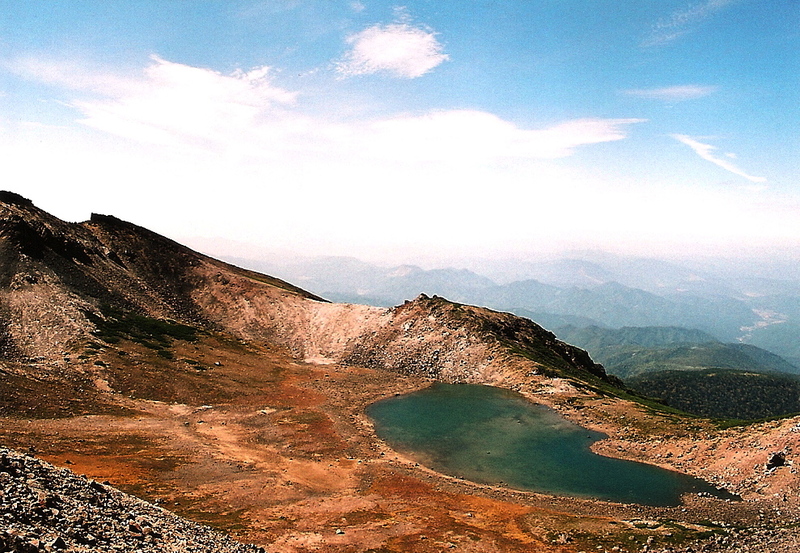 Shiomi in the Minami Alps, has a twin peak a short distance away. 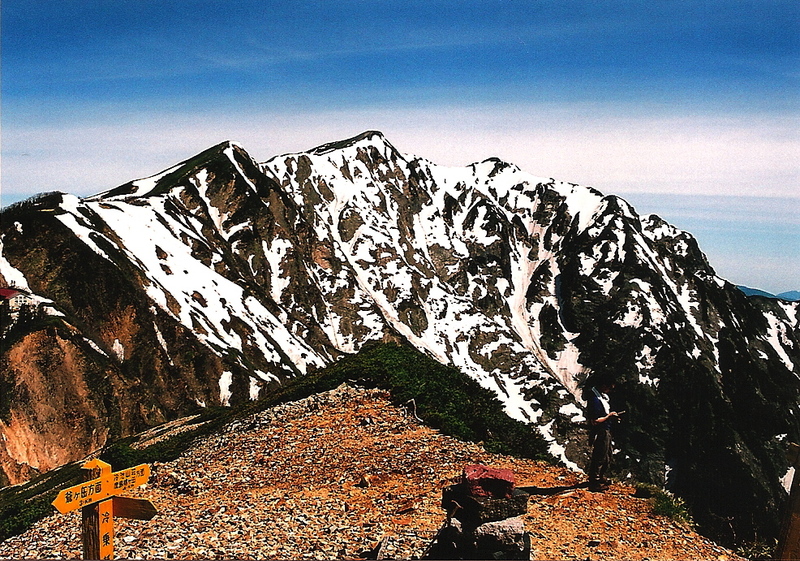 After eating lunch, we dropped to the saddle and climbed the twin, staring down into the vertical crags on the Hachimine-kiretto. There’d be no traversing over to Mt. Goryu this time around, even though it was still on my ‘to climb’ list. 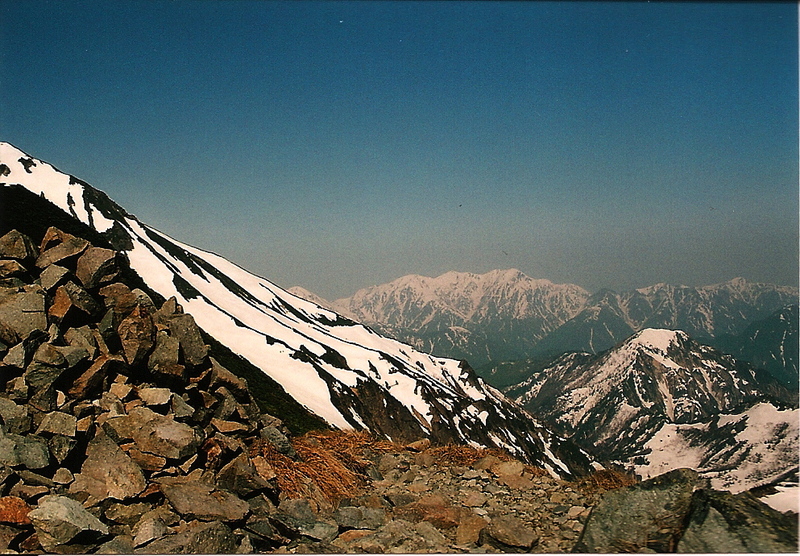 We ran into a handful of people on the summit, but all of them had come from Ogisawa – a much longer but easier approach. After celebrating our successful ascent, we retraced out steps back to the junction, thinking about the tricky snow traverse that lie ahead. This time around I took the lead, and was extremely surprised to find that some kind soul had built steps into the snow pack, making for an easy and comfortable crossing. My guess is that the hut staff must’ve come over here with their snow shovels, or perhaps another hiker had come up behind us. Whoever it was, I can’t thank them enough. Descending took no time at all, and the high pressure system stuck around for the duration of our hike. Walking back on the deserted forest road, Fumito and I chatted about our previous adventures and wondered if we’d be able to get together again this year for more hikes. I hung up the hat after this one, deciding not to tempt fate again until after the rainy season, where mountain #83 was quietly awaiting.